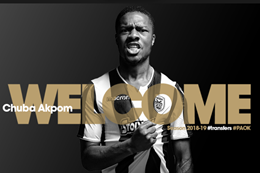 Greek Super League side PAOK write on their official website that they have completed the signing of young Nigerian striker Chuba Akpom from Arsenal. Akpom's deal with PAOK is for three years and he will wear the number 47 shirt for the 2018-2019 campaign. The 22-year-old was linked with several teams in Europe after impressing while on loan at Belgian club Sint-Truiden in the second half of last season, netting 6 goals in 16 games. Akpom has played for England's U16, U17, U19, U20 and U21 national teams and is credited with 20 goals for the Young Lions from 44 appearances. He has pledged his international future to the Super Eagles, having trained with the team in March 2017 ahead of a cancelled friendly against Burkina Faso. The London-born Akpom spent time on loan at English clubs Brentford, Coventry City, Nottingham Forest, Hull City and Brighton & Hove Albion during his time with the Gunners.